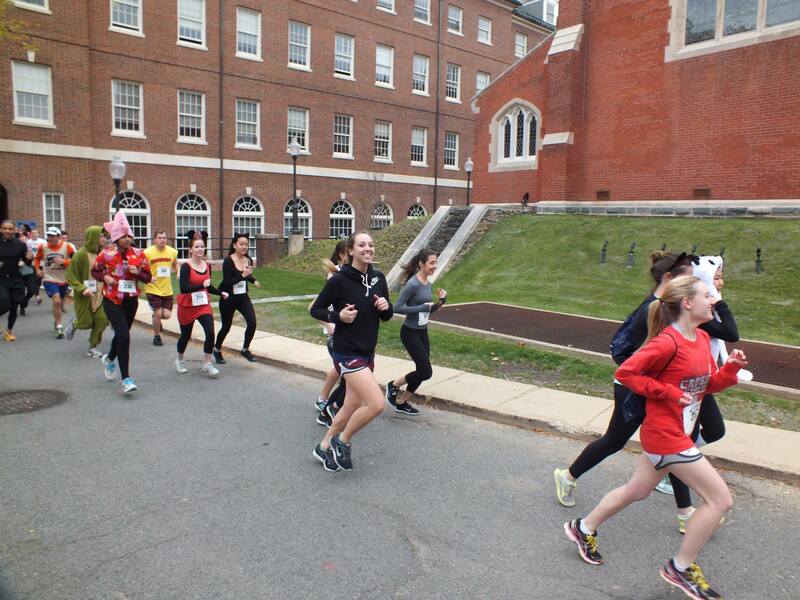 For the first time in its history, Georgetown SigEp hosted a university-wide 5K in support of a local charity. Labeled “The Halloween 5K Against Domestic Violence,” our chapter organized and fundraised to support an effort to reduce domestic violence through raising both money and awareness about this issue. A special committee of brothers devoted a significant amount of time to garner support and funds from the greater Georgetown community, and they proved extremely successful in this endeavor. 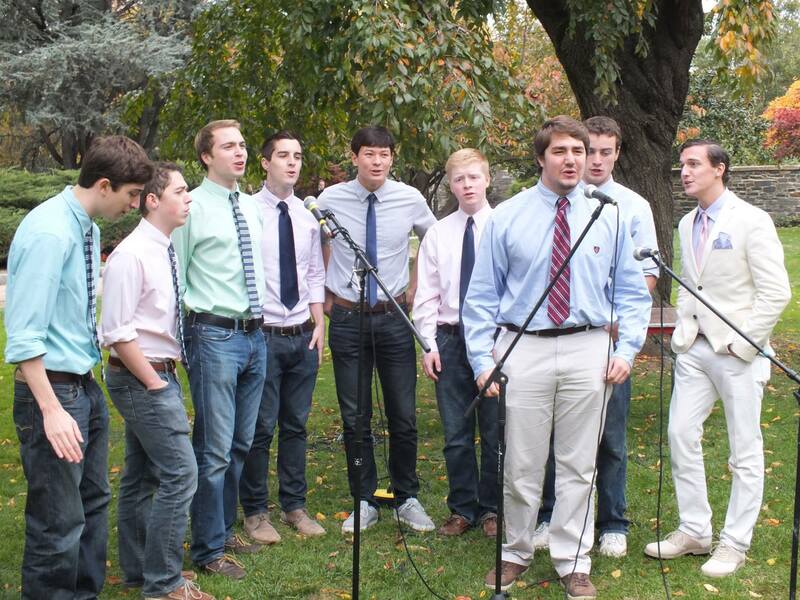 The Georgetown Chimes perform a set after the race. With the run itself taking place on Halloween, runners were encouraged to come in costume as they followed a well-designed route through the Georgetown campus. Serenaded by the Georgetown Chimes, the Georgetown Phantoms, and live performers furnished by WGTB, the event enjoyed a wonderful level of campus support. Cosponsors of the event included The Corp, Blue and Gray Tour Guide Society, GUASFCU, Georgetown University Women in Leadership, Men’s Club Soccer, Kappa Kappa Gamma, City Sports, Georgetown Running Company, Vineyard Vines, and more. With over 150 runners and volunteers in attendance, we were able to reach a wide segment of the University population, and we were proud of the turnout at the event. Representatives from Doorways before the race. 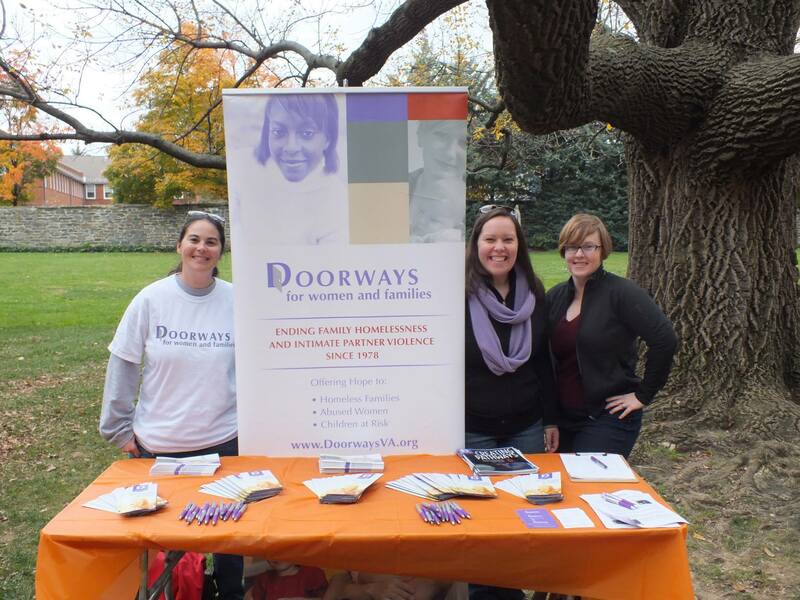 From a financial standpoint, we raised over $11,000 that we in turn donated to Doorways for Women and Children, a local shelter for women who no longer feel safe in their own homes. In all, this event saw our chapter organize to support a great cause, and we are extremely proud of our efforts this Halloween. We look forward to seeing even greater success at next year’s 2nd Annual Halloween 5K. Runners pass behind Dahlgren Chapel. To view over 100 event photos, check out our album on Facebook. GU SigEp was proud to welcome back over 30 alumni brothers for homecoming on October 26. We started the weekend with a chapter at which several alumni were present and we enjoyed an Epsilon presentation by current brother Andrew Arbeeny (MSB ’15). 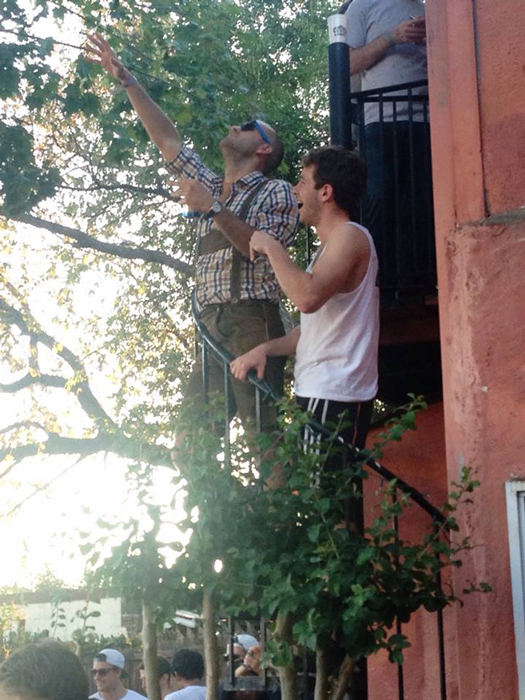 We then had a gathering at 3338 Prospect, at which, expectedly, far more alumni were present. The next morning started with the tailgate at 11 am where both current and alumni brothers were found in plenty. 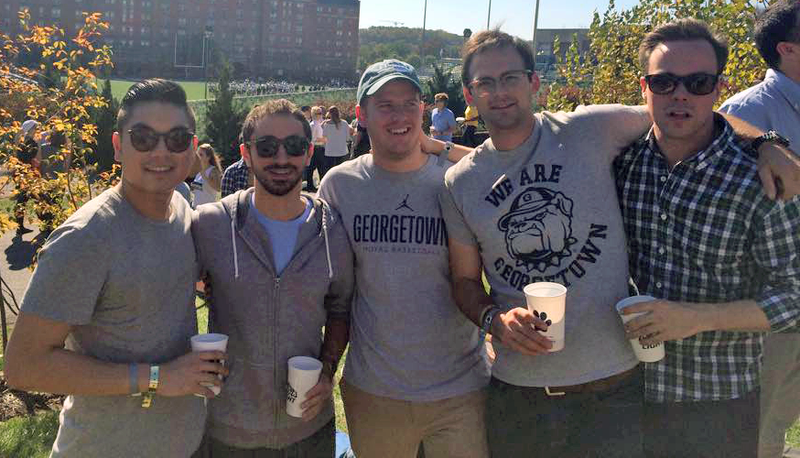 Properly adhering to Georgetown tradition, no attention was paid to the actual football game, as Pink House’s classic barbeque held much more sway. Serving as perhaps the largest party Pink House has had to date, alumni and brothers alike had a fantastic afternoon in weather that was far too comfortable for late October. Starting with the roast of a pig that seemed too large to actually have lived, the party went on into the late afternoon, and we hardly had any trouble with our friendly local SNAPS officer. From Jeremy Cairl’s lederhosen providing a hint of Octoberfest to Marc Byrnes’ (MSB ’16) dogged commitment to those classic rock songs that everyone miraculously knows the words to, the vibe at this year’s party was perhaps the best we’ve had, and it did Pink House proud for its last homecoming. In all, it was a great weekend, and seeing so many alumni back made us undergrads proud of where our fraternity has come thus far, and, more importantly, it helped us connect with brothers that can’t ever come back enough to the Hilltop. GU SigEp had an awesome time on their Fall 2014 retreat to Harpers Ferry, West Virginia. We arrived around noon on Friday where we split up into our cabins and dove into the first activity of retreat, storytelling. Prompted by words that they pulled out of an envelope, groups of four SigEps shared a story with their brothers from their life that related to that certain word. Like all exercises on retreat, storytelling was very open ended, and the stories we heard varied from hilarious, to profound, to nostalgic, to inspiring. Next, we headed to the river for the main attraction of white water rafting. In groups of four to six, we split up into rafts, chose bold team names, watched a safety video that undoubtedly had the attention of everyone in attendance, and got on the river. Once in the water, the focus turned to away from racing each other downstream, and almost immediately to sabotage of other brother’s rafts and crew. Not one raft made it too far ahead without another catching up to pull them out and into the river. After a couple hours of rafting, we headed back to our cabins for dry clothes, then immediately into the town of Harpers Ferry for the next retreat activity, dyadic. We again found ourselves in groups of four brothers, who we might not talk to all the time, and answered a list of questions designed to have us open up and learn about our brothers. An experience like dyadic is what sets SigEp apart: spending hours talking about the kind of people we are and want to become, talking about what’s important to us as students, brothers, and men, and admitting our fears and faults, but also our greatest attributes. Upon finding one open field in tiny Harpers Ferry for SigEp Circle, we were approached by a police officer that refused to believe that 50 college-aged guys could be up to anything constructive in a park at midnight. Christian Chung (’15) went and explained the nature of our presence there, but we all like to think he flashed his badge and pulled rank. As always, SigEp Circle was a moving and profound experience with brothers contributing, participating and observing. Questions ranged from amusingly lighthearted to very introspective, with everything in between. As three hours passed without anyone fully noticing, we agreed that it was necessary to head back to camp to sleep. My van decided to sneak away to McDonald’s…and wasn’t really surprised when we ran into four other vans there that all had the same idea. Sunday morning brought the birthday of Hayden Pascal (’17), pancake breakfast, and the start of our next activity, goal setting. The brothers met in a room and each VP on the E-board explained their achievements so far, and the upcoming goals for their respective boards. The chapter gave advice and suggestions going forwards for each VP, and we have a lot of beneficial ideas going forwards: including the founding of an established fall philanthropy effort to match our efforts from the springtime Relay for Life. Finally we ended with a hike up the mountain in Harpers Ferry. After an hour of hiking, brothers got to enjoy what Abraham Lincoln described as ‘the best view in North America’. On the way up and down, I was part of multiple amazing and constructive conversations, all of which were spontaneous, and the types that one can only have with brothers in SigEp. The catchphrase oft associated with retreat is that it’s a weekend that you’ll remember after you graduate, a standout in a blur of Lau, parties and hanging out in your dorm. Personally, I know I’ll remember this retreat after I graduate, because I already find myself thinking about the conversations I had that weekend on a day-to-day basis. Retreat has been my favorite weekend while at Georgetown this year, and I’m excited about the efforts to bring some of the elements of dyadic back to conversations held on campus. The weekend was an enjoyable and rewarding one, due to the men that I enjoyed it with. Such a retreat wouldn’t have been possible with any other group of men at Georgetown, exemplifying something that I know to be true, but somehow keep relearning: this fraternity is different.